Who is The Nametag Guy? Scott is a prolific entrepreneur, content creator, creative director and company storyteller with 18 years of experience building profitable brands. His unparalleled body of work includes 35 books, 8 musical albums, 3,000 articles on three award winning blogs, 600 speeches (including a TED talk), 88 training videos, 5 software applications, 3 music films … and 1 globally recognized brand. He’s also executed freelance, in house and & marketing agency work for hundreds of organizations like Nestle, Monsanto, NYC Department of Health, Chase Bank, General Electric, Staples, Disney, Hyatt & Verizon, as well as dozens of associations, startups and small businesses. He was also inducted into Ripley’s Believe It Or Not with the rest of the freaks. 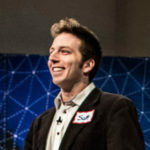 He launched Steal Scott’s Ideas in 2015. The project grew from a writing exercise to blog post series to corporate workshops to a business book and now a popular gameshow. Want to help it evolve into its next form? Stick around. Steal Scott’s Ideas episodes will be released on a seasonal, periodic basis. Each show comes with its own content driven blog post, with lessons on execution to help you take action on your ideas. Are you an idea junkie? Do you have a nose for innovation? And does your mind have difficulty turning off? Welcome home. Our community of innovators, artists, thinkers and entrepreneurs could always use another smoking hot piece of brain candy. Also, if you would like to become a contestant, contribute creative content, or help out in anyway, please for the love of god reach out. Want more emails to ignore?